Undersized, overlooked and riding the bench, Drew Billington could have taken the easy road and dropped basketball for his final two years of college. However, the Fairfield-native worked and tailored his game for success, and that made all the difference. 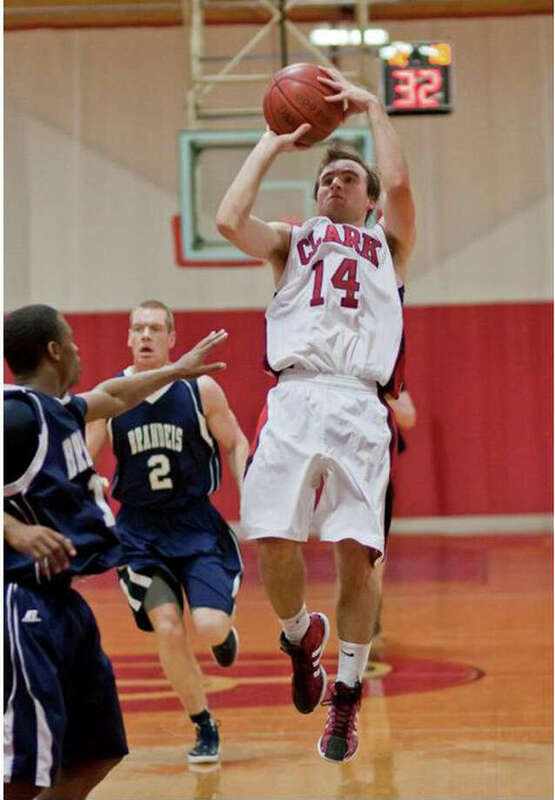 The 2008 Ludlowe graduate was the only Clark University basketball player to start all of the team's 25 games this year and finished his senior season second in the NEWMAC in assists, averaging five per game. "I set a goal to average five assists per game my senior year," Billington said. "Whenever I got an assist, it felt like I had scored." Billington's collegiate success came from his adaptability and willingness to alter his game from a scorer to a pass-first point guard. Although part of a team that reached the Division III NCAA Tournament in 2009-10, Billington was frustrated by his lack of playing time early on. He bided his time, but in his first two years he never played more than 10 minutes in any single game. And he became impatient. "I was frustrated because I wasn't getting minutes," Billington said. Clark coach Paul Phillips could see the disappointment both on Billington's face and in the meetings the two routinely had in the coach's office. The coach could relate. "I sat the bench my four years at Assumption College," Phillips said. "I told him I understood where he was coming from, but I also told him he'd get his shot at some point and he had to keep working." The work ethic was something Billington's high school coaches saw. "He was always the guy I wanted on the foul line at the end of games," said Brian Silvestro, the current Ludlowe varsity coach who coached Billington on freshman and junior varsity teams. "He was a committed, hard-working person who loved the game." As a sophomore, an undersized Billington played JV and sat on the bench of a senior-laden varsity team. However, when 10 seniors graduated from a 19-5 team, Billington as a junior took on the scorer's role, a spot he relished and in which he flourished. He averaged almost 17 points per game his senior year and finished his high school career with a sizzling seven-game stretch when he averaged 22.8 points and the team went 5-2, narrowly missing the FCIAC playoffs. "He was like our Superman that year," Ludlowe's then-varsity coach Josh Marko said. "He could take over games, and we needed him to score and he was unstoppable." Even as Billington scored, he still distributed the ball well, amassing a school-record 156 assists (7.4 per game) in the 2007-08 year. His emergence as a second-team all-FCIAC player that year attracted college attention, and he chose to play for Paul Phillips at Division III, Clark in Worcester, Mass. Most second-team, all-conference players would assume to play as freshmen. But the odds were stacked against Billington his freshman year. Plus, under Phillips, he was pushed not to score. "He'd tell me to pass first, pass second and then shoot," Billington recalled. "I had to adjust to what (Phillips) wanted me to do." Opportunity arrived his Junior years, when Billington started 16 of Clark's 24 games. Phillips began to see the dominant player that Marko had known all along could come out, and Billington began to flourish. "That point guard mentality was always there," Marko said. "I give him credit, a lot of kids wouldn't have stuck it out for those years he didn't play." This year as a senior, Billington took his game to another level. "He was really great all season long," Phillips said. "Of our 25 games, I'd say he had two where he did not have very solid games." Despite the Cougars' injury-plagued 12-13 campaign that ended in a NEWMAC Tournament loss to crosstown rival Worcester Polytech, Billington shined. He was unselfish and helped teammates such as Trumbull-native Travis Curley, who led the team in scoring, and DJ Bailey a second-team all-NEWMAC player. "He made some pretty average players better," Silvestro said. Phillips said Billington was so unselfish he almost deferred too much, but he paid Billington the ultimate point-guard compliment. "He was a quarterback of our basketball team," Phillips said. "I would say to him sometimes he had to think more offensively because defenses were so far off him." Now Billington is focused on life after basketball. He commuted to New York for an internship at Madison Square Garden in summer 2011 but still managed to maintain playing condition. "I really wanted to find a way to fit in all the things I love," Billington said. "I had a great opportunity working in human resources for MSG and made a lot of contacts." In the meantime, he continues to tutor inner-city middle schoolers through Clark's community service program, and Phillips sees the character in his departing player. "He's shown tremendous growth," Phillips said. "I'm really proud of what he's accomplished."